So, our roommate finally arrived in March, a little later than we thought but we’re happy he’s here. I can finally show you guys his space! The plan for this room was pretty loose and all-over-the-place for a whole lotta months, and for a while there it was looking like it was definitely not going to come together…but I’m pretty happy with how it turned out. The only thing I knew for sure about planning a nursery was that I wanted to sand and paint the crib myself. 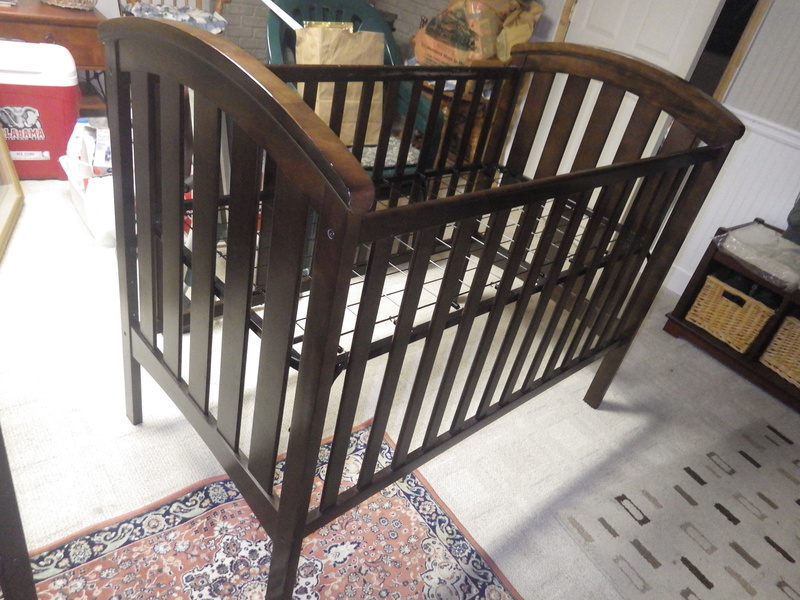 All I needed was a crib, and, ya know, to figure out how to sand and paint furniture. 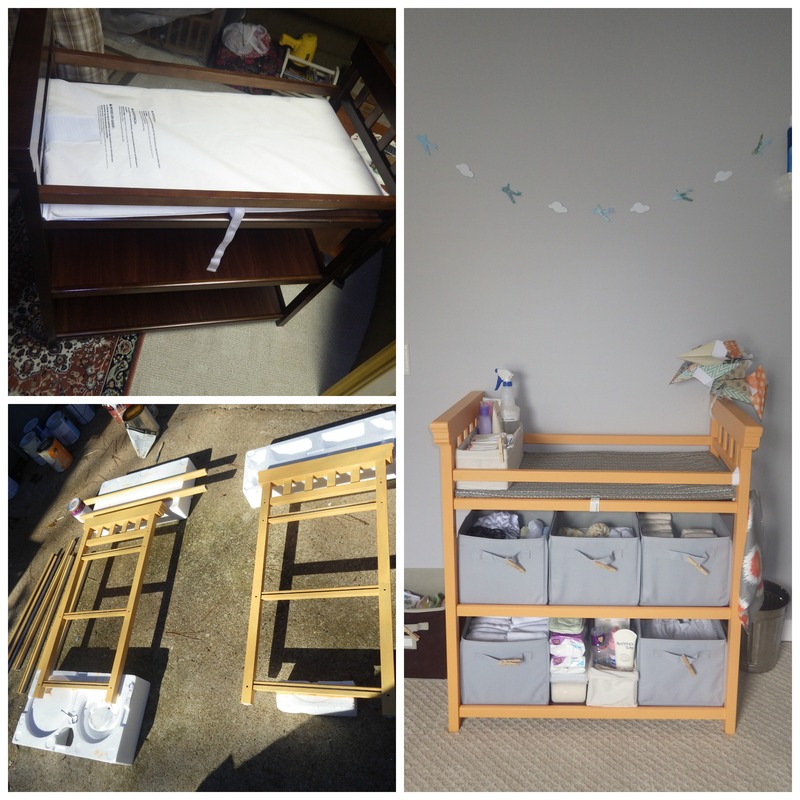 Then in October I took the crib apart and got to work. Everything was sanded by hand using a little plastic sandpaper block. It was a lot more work than I anticipated, but all that sweat and elbow grease and time spent thinking about who this little person was and all my hopes for him or her… it was time well spent. But still, I was pretty pregnant and it was getting cold out, so I had to work little by little for a million years. 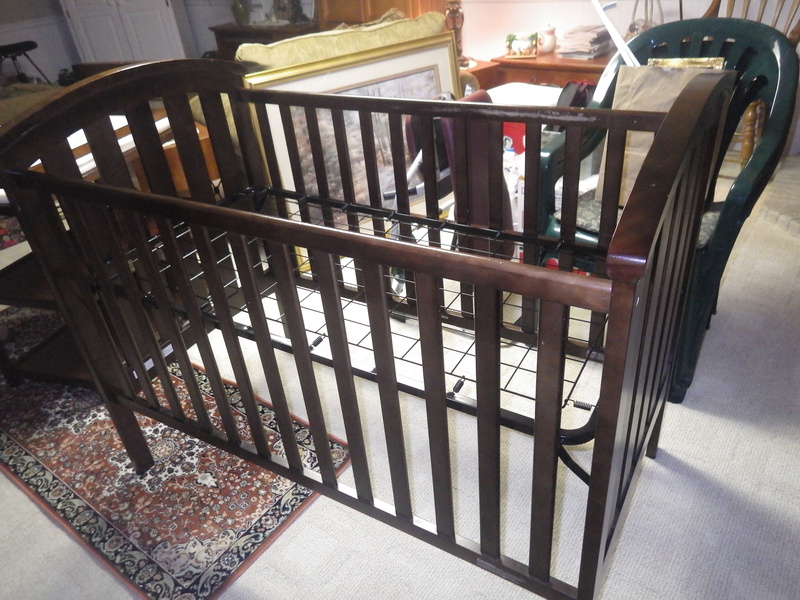 After finishing the crib, I was supposed to start on the changing table… but then I found a nursery glider on Craigstlist for $20. It was black, which I didn’t love, and the ottoman cushion was kind of stained. But otherwise it was in great condition. And it was $20. Soooo…. This time I decided not to sand it first because I was about 8 months pregnant and not feeling it. I just painted right over it. It only took about half a sample of Behr’s Voyage to cover both the chair and the ottoman. I used a fine grit sand paper to rough it up a bit and bring the original black out through the blue. Then Wes painted over the whole thing with a clear polyurethane. To clean the cushions, I sprayed the heck out of them with regular rubbing alcohol, then used a white sponge and a rough scrub brush to get the stains out. And now it looks like this. 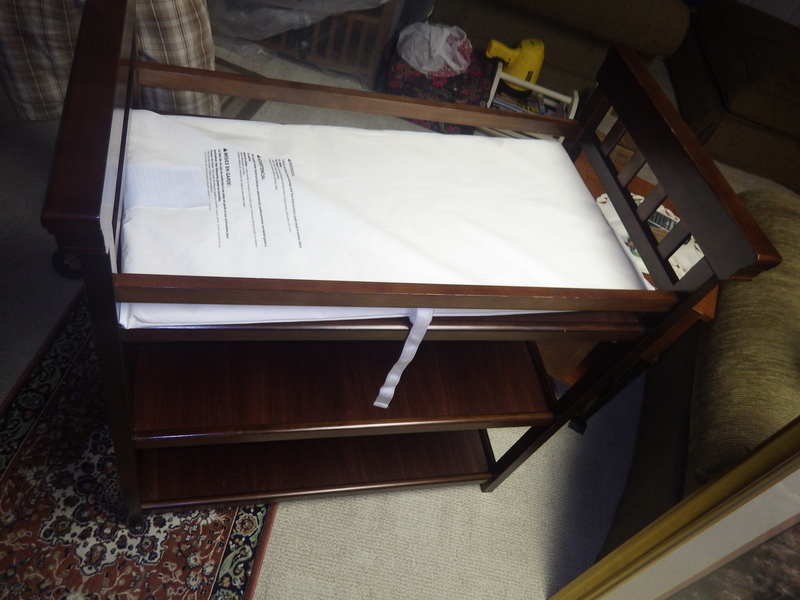 Sometime when the paint was drying on the glider, I decided to go back to the changing table. Again, no sanding. But just in case the lazy paint + polyurethane thing I did on the glider didn’t work out, I thought I’d try a different method. Because, why not? Right? So I had Wes put a primer on it and then painted it with the same color I used in the closet. I’m sure I was a lovely sight in the driveway, kneeling over some slats of orange wood with my giant belly covered in paint. The little bin on the top shelf of the changing table has three small sections that hold all of my cloth wipes, snappis, spray bottles with wipe solution, and CJ’s BUTTer. The gray bins are full of pocket/all-in-one diapers, diaper covers, inserts, and prefolds. It’s very hard to see but there is also a little bouquet of paper airplanes (made by my friend Jessica for my baby shower) attached to the top right of the table. 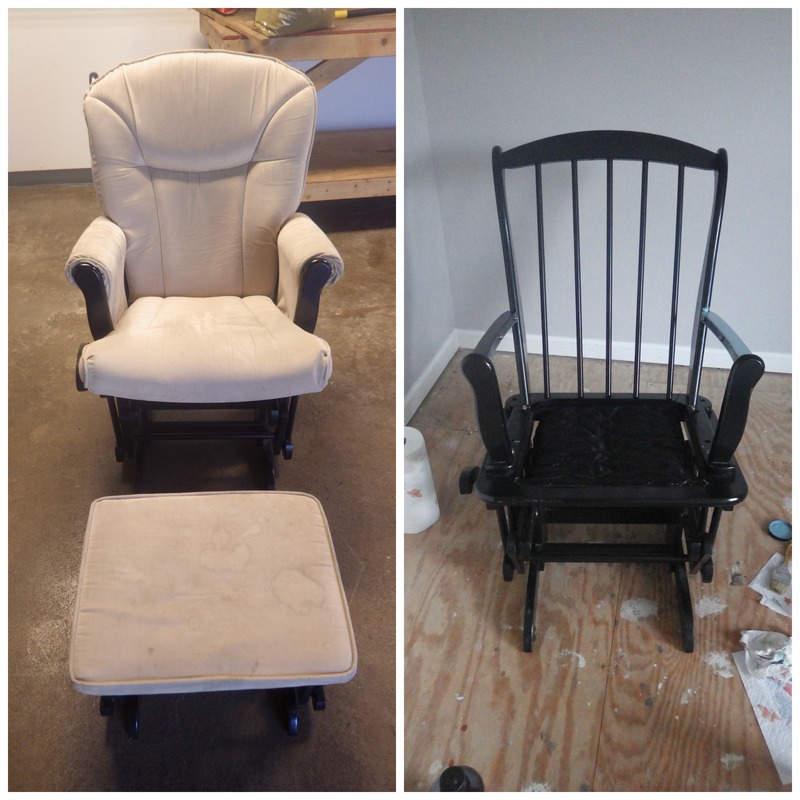 Of the three refinishing methods I used, the primer + paint for the changing table was the least successful. 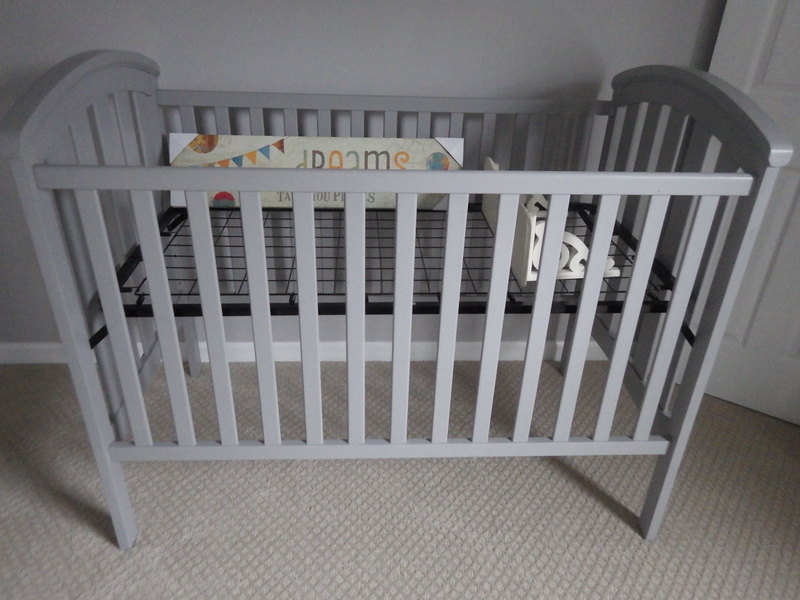 It looks nice enough but there are already scuffs in the paint on the top bar of the changing table where my jeans rub against it when I change him. It’s not so bad that I’m going to do anything about it though. 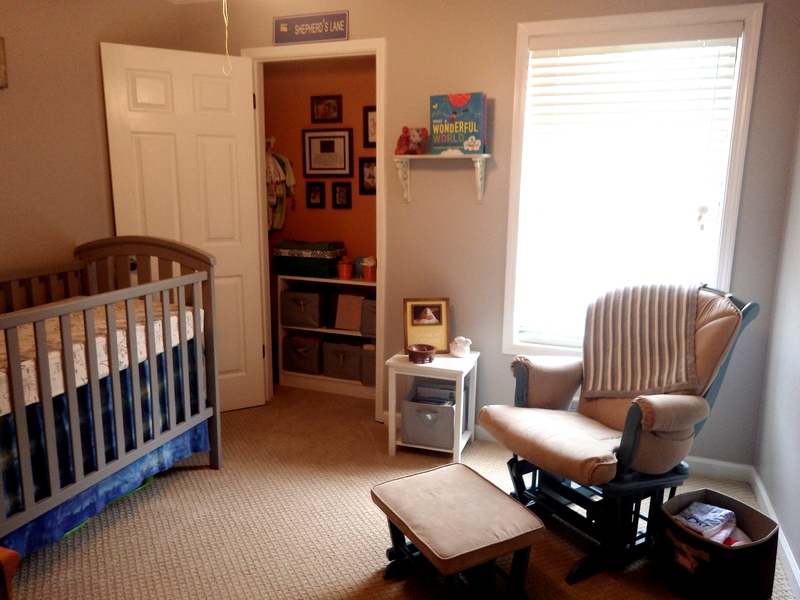 The last little project I had for the nursery was to redo the closet. 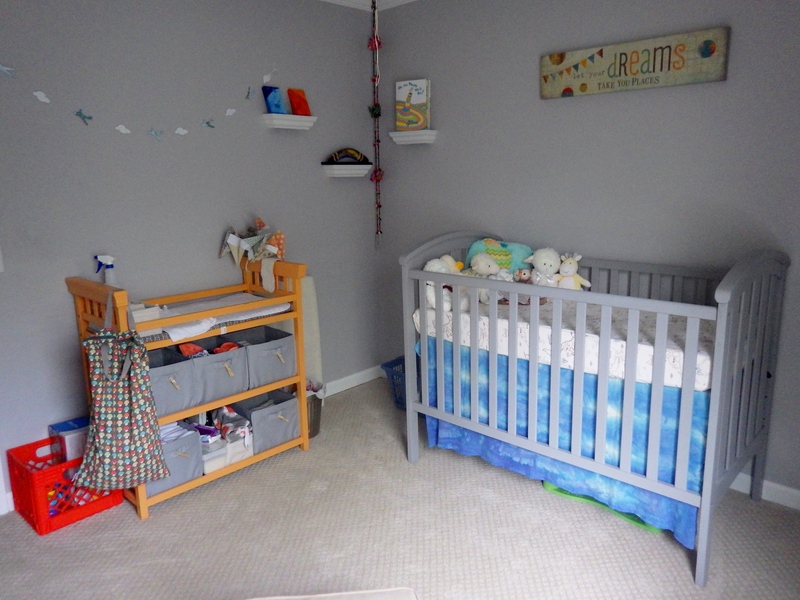 The room is really too small to have a dresser and a changing table; I decided to rework the closet and use a bookcase in there as the dresser instead. I bought this bookshelf several years ago for $10 at a thrift store. It was painted green so it went really well in this room when it was my craft room. Wes repainted it white so it’d work better in here now. I also changed the direction of the closet rods to hide his clothes a little and make the closet more of a focal point in the room. There are rods on either side of the closet; I may add another bar later beneath the ones that are already up but right now I have plenty of room for his tiny clothes. Each bin has a labeled clothes pin clipped to the handle to help me remember what goes where. The top bins have his onesies and pants in them; the bottom contain blankets, swaddles, and extra crib sheets and changing pads. There are more blankets and some knitted hats in the blue basket on top. My mom gave me those little orange pails and I use them for his newborn mittens and tiny little socks. The photo albums pictured hold his postcard collection. Here are some of the little details in the room. Top: two small paintings by Wes; boomerang was a gift from Wes’ old boss from a trip to Australia; hanging elephants from Courtney in Thailand; Oh the Places You’ll Go from Wes’ cousin; stuffed elephant from Courtney; What a Wonderful World from Jessica (super special as that is the song my father and I danced to at my wedding). Bottom: crochet banner by Jessica; little wooden ‘ava bowl was a gift from the our coworkers in Manu’a. So that’s it. It’s kind of hard to plan a room for a person you know absolutely nothing about, but the little dude seems to like it well enough. And because I got the furniture 2nd hand and used other pieces I already had, the whole room (except the carpet) was less than $150. The only things I really felt like I “splurged” on were the canvas above his crib ($15 at Hobby Lobby) and an $8 picture frame from Kohl’s. (ha!) Saving money AND babies! Does it get any better than that? 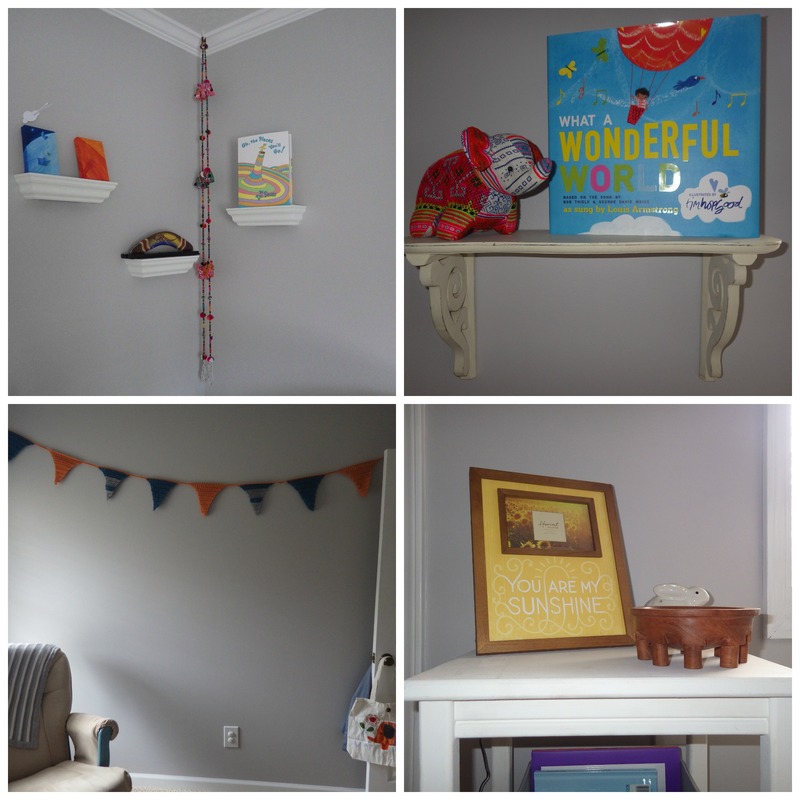 This entry was posted in Home Renovation, United States and tagged baby room, diy, nursery, painted crib, refinished furniture. Bookmark the permalink.